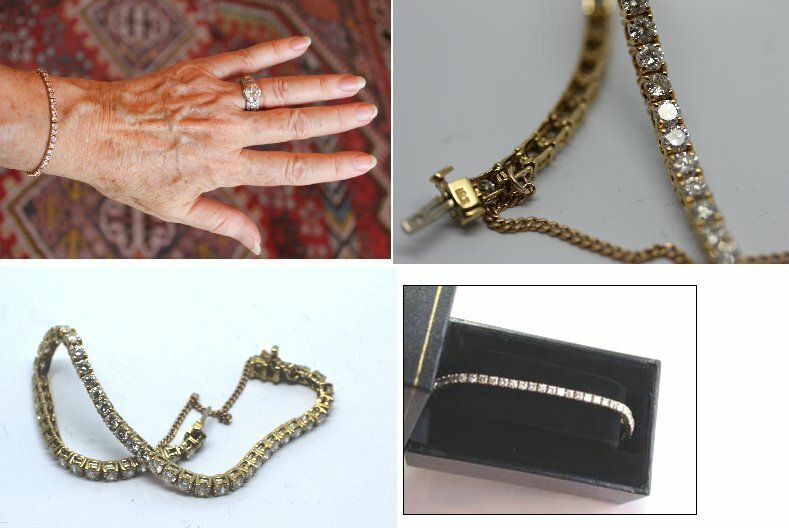 Fine, well made, vintage 18k yellow gold 7" diamond line bracelet containing a total of fifty-three (53) .10ct round brilliant cut, prong-set diamonds, for a total of 5.30 carats. Diamond Clarity is a fine SI-1, Diamond Color is top white G-H . Bracelet weight is 11.6 grams. Speaking of diamond line bracelets...what the heck is a diamond tennis bracelet? A tennis bracelet is a simple, flexible, in-line diamond bracelet. The term tennis bracelet was first used in the summer of 1987 when the popular tennis player Chrissie Evert dropped her diamond line bracelet during a match at the US Open Tennis Tournament. She had to stop the match until she found her bracelet. Since then, that particular style of bracelet has been called a tennis bracelet.